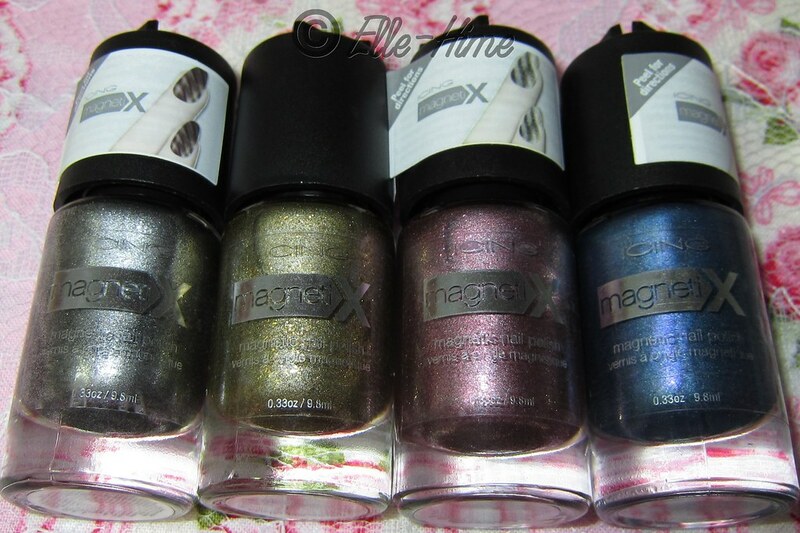 Princessly Polished: Swatch & Review: Icing magnetiX Collection! 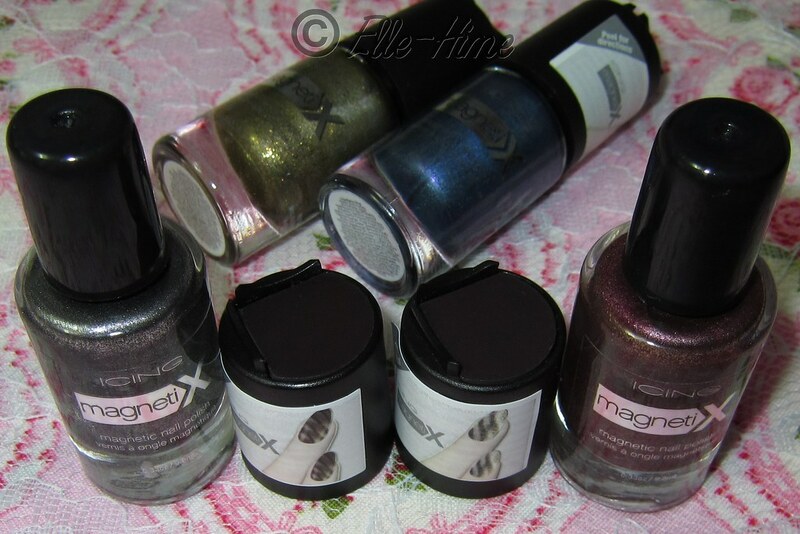 Over the weekend I saw on Icing's website that they were carrying a new line of nail polish - 4 magnetic shades. I love magnetics! I went to Icing, went around the whole store and was afraid that they didn't have them yet. When a girl working there asked if I needed help I told her what I was looking for - she knew what I was asking for because they had just gotten these nail polishes in and were up on the check-out counter! I did some serious nail polish haulage! 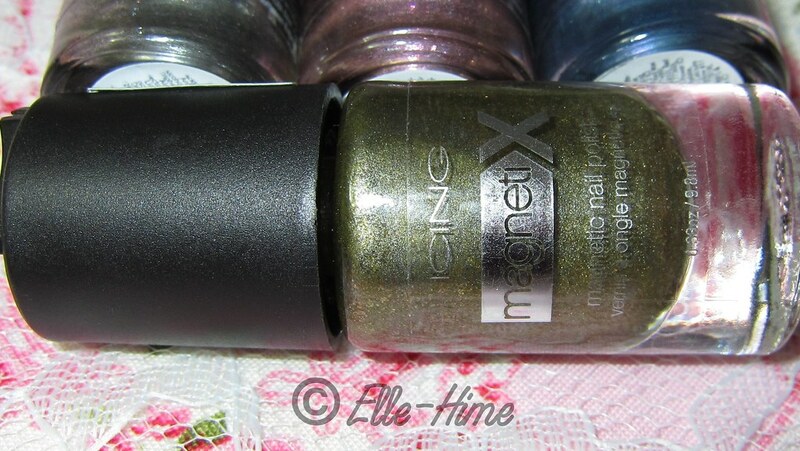 Thus I bring you swatches and a review of the new Icing magnetiX line! I am seriously impressed with these nail polishes, and I have to give a nod to Icing for putting out magnetic nail polishes before most major brands have even announced a release date for their own. Find out more of my thoughts and see more pictures after the jump! These 4 colors have no individual names, and are simply labelled as being "magnetiX". I find it funny that Icing and China Glaze both call their magnetized polishes by the same name. True, Icing makes the X stand out more, but I wonder if this could cause some sort of an issue anyway. These polishes are 9.8ml size and retail for $9.00 USD a piece. For magnetics, that's pretty cheap. The only thing that gives them a lower quality feel is the brushes being slightly bent. They have a bit of a curve like the hairs are pressed against the bottom of the bottle. They are still totally useable and have a wider brush that helps in getting the nail polish on quickly and evenly. Now for some really good, set-your-mind-at-ease news. Every bottle says that it is not tested on animals. Hooray for cruelty free! And, these are all lacking Dibutyl Phthalate (DBP), Formaldehyde/Formaldehyde Resin, Toluene, and Camphor in their formula. That puts them in my "Big 3 Free +" category! You may see the labels to read them yourself if you click the small image here - be warned that it's huge! Also, Icing magnetiX officially have the best magnet-caps yet! The magnet topper separates from the brush cap, but no worries, they are on very securely. At first I didn't know that they did come off until one loosened as I was putting the caps back on. There should be no issue with losing these. The other awesome feature is that they have two finger rests. That way the magnet is easy to use for two different pattern directions, and you can make that pattern consistently. And... yes, it just keeps getting better... there are two different magnet designs for this collection. So, let's talk about the colors, and what you get with each polish! Since they don't have given names I studied each one and named them according to basic color description. 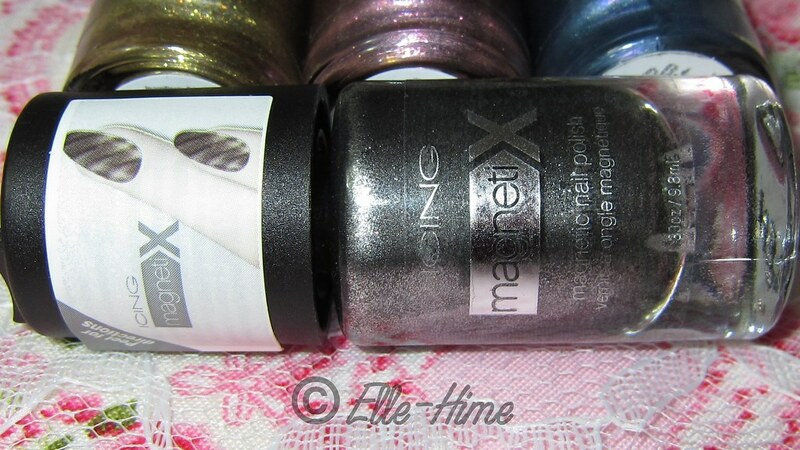 Icing magnetiX Black Sparkle: This polish is exactly how it sounds. A black base shot through with not only silver magnetic particles, but also glittering silver shimmers. The effect on the nail is simply stunning and this tops as the prettiest black magnetic polish I've seen yet. Every magnetic nail polish collection seems to have a black, but I'm really happy to own this one. The magnet included with this polish creates diagonal lines. 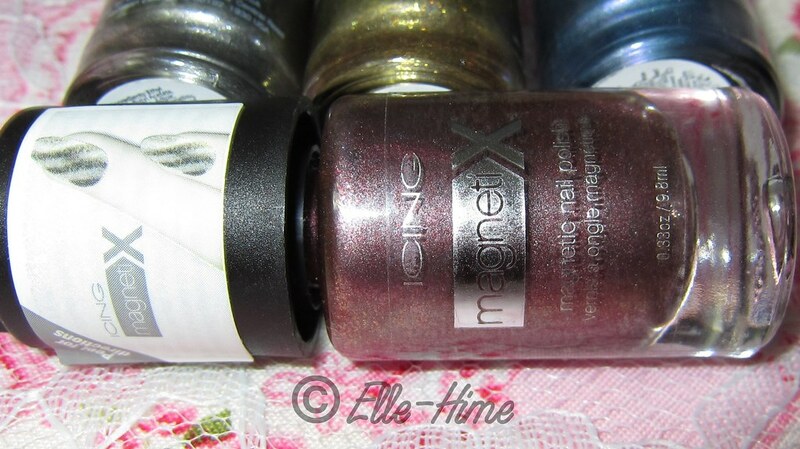 Icing magnetiX Antique Brass Sparkle: I was the least excited about this color, but at the same time intrigued. It looked glittery, it had an overtone of green; how would it look on the nail? Rather than being a true gold, to me it's more of a tarnished metal. Gold doesn't look good on me, but this I can wear. It has lots of large yellow shimmer particles floating in a greenish base. The hardest color to explain, but striking with the magnetic design. It also comes with a diagonal line cap. Icing magnetiX Rose Sparkle: I was hoping this would be something special, and I'm pleased to say it is. I don't think it classifies as a true red, but it's too deep to be simply pink, so I call it rose. You can occasionally see a yellow shift in the bottle, but this completely disappears on the nail. Instead you are surprised by pink, purple, and blue shimmer particles in a burgundy base. These colors don't always show, it depends on your lighting. The magnetic design shows up as pink. The included cap creates a wavy pattern. Icing magnetiX Blue Shimmer: I definitely feel like this color has been done before, and it lacks the glitzy shimmer of the other three colors, which is sort of a bummer because it would be instantly more awesome if it had their glitter. However, it does have a slightly shimmery finish and a purple tone in some lighting. Also, it is the most opaque of the collection and very easy to work with. It also gets and "interesting" cap - you can create wavy lines. Let's see those nail wheel swatches one more time. Left to right, the first 4 nails are just one coat, and I goofed on Rose Sparkle's magnetic pattern. Each color was done with it's own magnet. The next three are done with two coats, and magnets turned the other way. The last nail is just one coat of Blue Shimmer because it didn't need another coat, I just turned the magnet the other way. Two pictures to help show the movement of the magnetic design in the polish at different angles. These have a lot of movement. Also note that the magnets for Rose Sparkle and Blue Shimmer create their waves in opposite directions of each other. I can verify that the exact direction of your wave magnet's lines is pure chance. Directions for use... I honestly didn't even read. All magnetics work the same: paint quickly, hold magnet over them and hold it still! You can only do one nail at a time and the longer you hold your magnet in place the stronger your pattern will be. Just be careful not to hold it too close! I found the formula on these to be easy to work with; I only needed one thick coat on my own nails and they looked great. 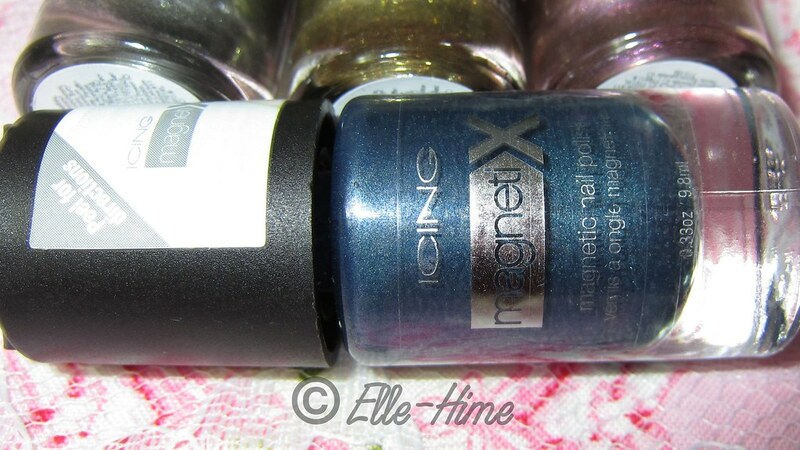 These polishes dry quickly and have a soft shine finish. The durability is not so good; prone to chipping like most magnetics. My helpful hint would be to give these polishes a good shake before using them. Cool, that's great! Maybe the blue will grow on me more... It's pretty but looks so much like my LCN one, haha. That I am really not sure about! I know a drugstore is stocking the yellow color in different bottles - at least they look like exact dupes, anyway. That brand also has other colors available. Sorry I'm not very specific - I've seen very little info myself and hardly any pictures. If Claire's has these too I wouldn't be surprised if they had a green and a purple version (they were seen in the drugstore line), if these few magnetic polishes are all the same, just in different bottles. I emailed Claire's corporate and they said that the Icing ones are exactly the same except that Claire's has one more color than Icing. So I am thinking it is that emerald green! Good to know! I wonder abotu the drugstore brands as well...this month's NailPro has a lot of brands advertising magnetic nail polishes, including Gelish! So it's going to be an exciting trend as predicted!